As I write this we are sitting in a hotel room, waiting to take off for our new home in Algiers. All our things have been packed up and either shipped ahead of us or put into storage, so we'll be living out of suitcases for quite a while. (Watching all our furniture get wrapped in masses of brown paper and tape was a bit like watching a Christo installation). 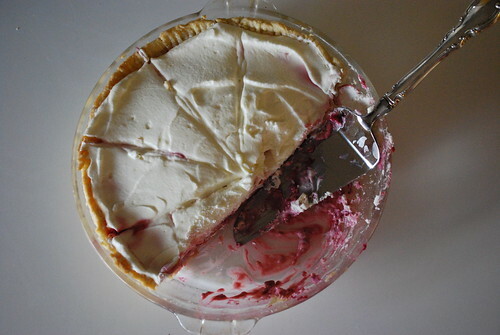 In the meantime, we'll leave you with Paul's Great Aunt Ruth's raspberry cream pie. This pie is super simple and easy to make and perfect for summer. Basically, the pie relies on a reaction between lemon juice (acid) and sweetened condensed milk, which thicken into a custard. This easy custard formation is one of the things sweetened condensed milk was invented to do. Raspberries are blended into the custard, and before serving the whole pie is topped with spiked whipped cream. We usually make this a few times during the summer, especially for barbeques. We hope to be back blogging about markets in Algiers as soon as we get settled. Until then, we encourage you to have some pie! The raspberries will sort of fall apart and melt into the custard, which is a good thing. 1. Prepare your pie crust and let cool. 2. Drain off 1/4 cup of juice from the bag of frozen raspberries. There will still be a little bit of juice in the bag with the raspberries. 3. Combine sweetened condensed milk and lemon juice in a bowl. Fold in the raspberries, combining well. Pour into pie shell and chill for at least 3 hours in the fridge, until set. 4. Whip cream to soft peaks. Slowly add the powdered sugar, beating cream to stiff peaks. Fold in the eau de vie. Top pie with whipped cream. Chill until ready to serve. that looks so delicious! Can't wait to make it myself! Mmmm, this looks so tasty! 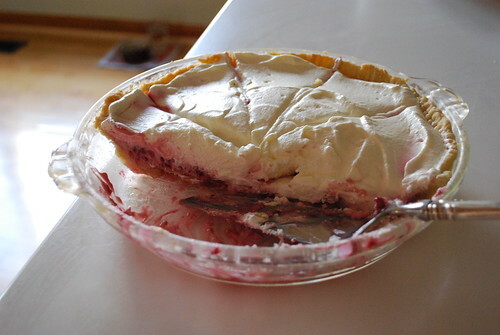 I don't think I've ever had a raspberry cream pie...it sounds lovely! Yum! How long does this keep? I am interested in making this. Can't wait to read about this next chapter in your life. I hope you blog often about your new home. No need to worry how long this pie will keep! It will be gone before you know it. I made it yesterday for a bbq and everyone LOVED it. Definitely making it a staple, go-to desert for summer around here...could be great with so many different berries/fruits...I think I'm going to try a graham cracker crust next time for fun..since my pre-baked dough recipe just isn't quite there...thanks for posting this! YUM! You don't need to worry how long this will last! I made it yesterday and brought it to a bbq - the pie glass was literally wiped clean! Delicious and so easy...it could be good with so many different fruits/berries. Thanks for posting this! YUM! Next time I think I am going to try a graham cracker crust...just because my pre-baked crust needs some work! This was FANTASTIC and so easy - thanks for sharing the recipe. I plan on making this a lot!